While commentating on a video I recently posted to YouTube I was critical of a television sports commentator speaking within it who declared that a defender hit with the ball while on the goal-line defending the goal would (always) be penalised with a penalty stroke. The ball had in this particular incident been deflected up into the chest of the defender from very close range off his own goalkeeper – and yes, in such circumstances the award of a penalty stroke is correct, but the statement made is not (this commentator also said several times during the match that any ball-body contact would (should) result in penalty against the player who was hit with the ball – which is also incorrect ” It is not always an offence if the ball hits the foot, hand or body of a field player. The player only commits an offence if they gain an advantage or if they position themselves with the intention of stopping the ball in this way”.). I pointed out that if the defender had been hit like that by a ball propelled from close range by an attacker a free ball should (must) be awarded to the defending team. (In the same match the NZ team tried to score a goal during a penalty corner using a pass followed by a high deflection of the ball at the goal from less than one meter (the ball hit a post and then the goal cross-bar and bounced back into play). That defection shot narrowly missed the head of a defender after hitting the goal-post. Had the ball been played directly at that defender he would have had no chance to evade it. Evasion in such circumstances has to be considered legitimate and therefore an indication of dangerous play by opponents. This is true even if the evasion attempt is not successful and the player is hit with the ball). These assertions have to be correct because otherwise Rules 9.8 (dangerously played ball) and the Explanation with Rule 9.9 (ball raised towards an opponent within 5m) would be ignored. Comment was made about what I had said during that video by an umpire from the Netherlands, who subsequently gave me a link to a special letter to umpires from the KNHB. The relevant part is set out below. Obviously inaccurately translated by Google Translate below, but the message is clear enough for comprehension. (this does not apply to the line stopper in a penalty corner situation). The invented clause, given in parenthesis, will always conflict with the second statement and is likely to align with the first statement, so I find the ‘club safety’ title ironic with this clause included. I also got another translation which makes even less sense. (this does not apply to the line stopper at a criminal responsibility situation). I does not matter which translation I write about but I’ll take the first one because I have been told by the Dutch Umpire that this is how umpires are instructed and anyway, to refer to criminality (by a defender) seems beyond bizarre. (There could well be a case made for criminality by the player who propelled the ball, but the deliberateness of a severe action (for example propelling the ball at the head of a defending opponent with the intention of inflicting injury) would be difficult to prove without several instances of it occurring. There might be need to be able to demonstrate that the player had been warned or penalised for doing it on a previous occasion – possibly even in the same match before criminality could be asserted. This difficulty has always stood in the way of penalising a deliberately dangerously played ball). The first difficulty about applying this (this does not apply to the line stopper in a penalty corner situation) exception to legitimate evasive action, is that it is not a legitimate i.e. legal, Rule clause (which ‘kills’ it stone dead); it is an invention by the KNHB who do not have the authority to invent or impose such exceptions to the FIH Rules of Hockey (nobody other than the FIH Rules Committee has this power). It was not drafted by the FIH Rules Committee and submitted to the FIH Executive for approval and then approved by the Executive, which is the only legitimate procedure for making or amending Rule, (that is why it is not in the FIH published Rules of Hockey) so it is not and cannot be considered to be FIH authorized and should not be applied by any umpire anywhere in the world as if it is authorized by the FIH. I am not referring here to a correct interpretation of a valid Rule statement using different wording with the same meaning, which would be acceptable, but to contradiction. This exception does not even appear in the Dutch language edition of the Rules of Hockey produced by the KNHB themselves. If Rules 9.8 and 9.9. would not apply because of this exception then there would be no emphasis on the safety of players or an enforceable demand for the consideration of the safety of other players or an enforceable demand that players behave responsibly – and the FIH Rules Committee might just as well be disbanded and cease its function. Then all National Associations could compose their own Rules, as the KNHB have done here and we could wave goodbye to participation in the Olympic Games (because of the IOC demand that there be a sole world Rule authority for any sport included in the Games): this means that the FIH are obliged to prevent National Associations or any other body or group from imposing their own “Rules” or altering FIH Rules. There is also the problem of the Common Law legality of the exception. In Civil Law, accusation of the tort of negligence is often defended by pointing out that the plaintiff knew the risks and knowing of them willingly accepted them and in such circumstances there is at least contributory negligence by the plaintiff. Sport is an area where it may be claimed that participation alone carries a certain risk and that the risk must be assumed to be accepted by willing participants. But that legal defence cannot be used if the defendant (the player who propelled the ball) has caused injury to the plaintiff due to a breach (especially a deliberate breach) of a Rule of the game being played. In hockey it is declared in Rule that to raise the ball (with no minimum height mentioned) towards an opponent within 5m is dangerous play, i.e. doing so is prohibited. There is no Rule forbidding a defender from positioning on the goal-line (if there were an umpire would be obliged to clear the goal-line of field-players before the commencement of a penalty corner). It is also the case that causing legitimate evasive action (forcing evasion to avoid the probability of injury) defines a dangerously played ball (with no height or distance criteria for legitimate evasive action mentioned in the Rule, so no such limits can be assumed). Therefore any ball propelled towards an opponent, from any distance, where there is potential that a player may be injured if hit with it, can be a cause of (force) legitimate evasive action and can (must) be considered dangerous. Is that extreme and unreasonable? No, not when the ball can be propelled at a player at velocities in excess of 150 kmh and often is. Stripping out legitimate evasive action as a definition of dangerous play removes the possibility of dangerous play and that runs contrary to the FIH declared Rule emphasis on player safety, so doing that cannot be correct or acceptable. Demonstrating knowledge by a defending player that the ball might be propelled at the position of that defender is an insufficient justification for penalising a defender hit with the ball (or awarding a goal if evasive action is successfully taken) because it is also true that the ball might be propelled elsewhere rather than at the defender forced to evasion – the defenders cannot know with certainty where the ball will be propelled – and attackers often engage in deception to cause uncertainty about the timing and positioning of the shot. Moreover, when there is a defender positioned on the goal-line the player propelling the ball knows where that defender is positioned both before the ball is propelled and while it is being propelled and chooses anyway to propel the ball in the direction it is propelled while having that knowledge – and also with knowledge of the existence of a duty of care towards the defending players. The admonishment (i.e. Rule – “players must”) which demands play with consideration for the safety of others is set out in the rule-book on the very first page. Players are also instructed that they are expected to play responsibly (play with care and take responsibility for their own actions) at the commencement of Rule 9 Conduct of Play. The fact that the existence of a dangerously played ball is based on evasive action means it must be acceptable in Rule for a defender to be in a position where evasive action may become necessary, it is therefore illogical to declare that a defender should not or cannot legitimately position on the goal-line to defend the goal during a penalty corner or may be penalised simply for being so positioned or for having accepted risk. Defending the goal is not in itself irresponsible behavior and attempting to defend a goal with the hockey stick can never (unless there is backsticks) be considered to be an illegal action (intent to use the body to stop or deflect the ball is an entirely different matter – but the umpire needs to be certain of such intent before it may be penalised, a failure to stop the ball with the stick when an attempt is made to do so, cannot be assumed to be intent to use the body to stop the ball if it is missed with the stick even if the body is positioned behind the stick). When a ball is raised at another player and obliges that player to take evasive action to avoid injury (the opposite of intent to use the body to stop the ball) it is always the fault and the responsibility of the player who chooses to raise the ball in this way, not the fault of the player towards whom the ball was raised. If any penalty is to be applied in these circumstances it should always penalise the player who raised the ball – not a difficult concept and one that is fair and completely Rule compliant. “But that will make it more difficult to score goals” That’s true, but so what? It is right and proper that it should require considerable skill to score a goal. The emphasis of the Rules is supposed to be on player safety, not on unfairly disadvantaging defenders or making easy the scoring of goals. I posted this article more than six years ago and took it down after about six months exposure. I re-post an edited version, with videos added, because this needs to be asked:- What has been done since May 2012 to make hockey a safer sport? Nothing has been done to limit the way in which a ball may be propelled towards another player from beyond 5m and even the existing restriction on raising the ball towards an opponent within 5m (given in the Explanation of Application of Rule 9.9) is widely ignored. The video below shows an incident during the 2018 WWC in which an attacker raised the ball towards a defender positioned within 5m of the attacker, causing her injury, and the umpire awarded a penalty stroke. I have no idea why the Japanese defender was penalised at all. The umpire saw no reason to intervene during the play shown in the above video. 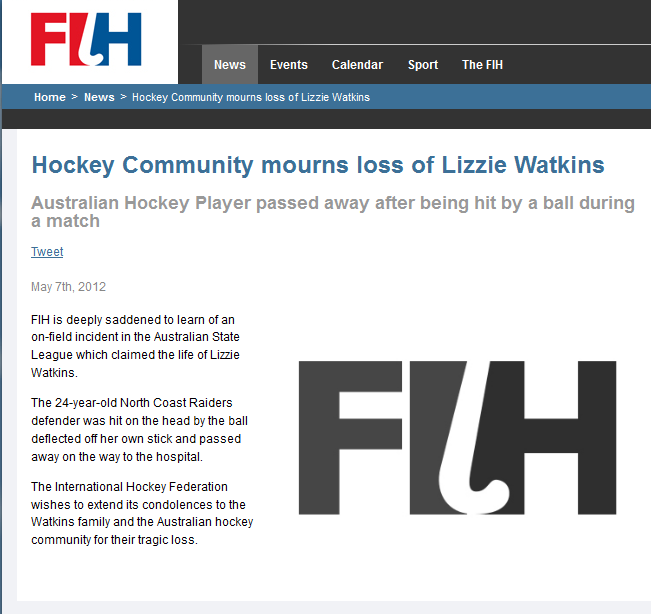 The fact that the death of Lizzie Watkins was not caused by an opponent raising the ball towards her with a hit, scoop, flick or deflection (there seems in fact to have been a deflection up off her own stick) appears to have been accepted as an indication that all is well, rather than as terrible warning that even fit high level players are at risk from ball injuries when the ball is raised by an opponent with a stroke or deflection – just as other participants are. 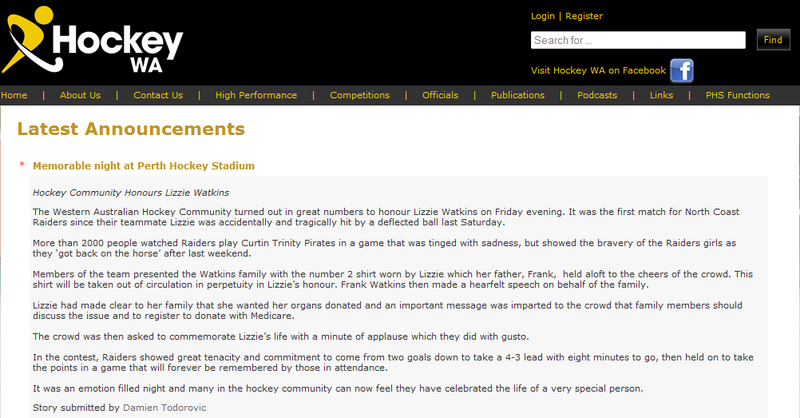 Reports on the death of Lizzie Watkins in a field hockey incident. Aside from a mention earlier in the week on the WA Website that Lizzie was “Rushing to tackle” there has been no hint from those involved that the incident occurred during a penalty corner or that a drag-flicked shot was made. Later reports state that the incident occurred during open play. Irwin, unable to track the ball from the moment it was propelled, because it was screened from him, had no chance to evade it. He knew the ball was traveling towards the goal but not the exact path of it. He was wearing a mask but instinctively turned his head to protect his face and was hit on the back of his head just below his ear. A few centimeters higher and the strike could have been fatal to him. The game resumed with a penalty-stroke against Cookstown – for the ‘offence’ Irwin committed – being hit with a dangerously propelled ball. 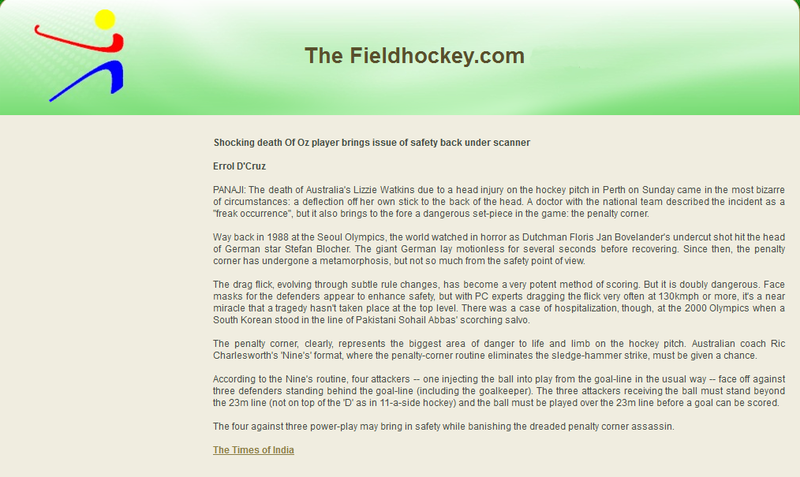 I agree with Errol D’Cruz (Field Hockey.com article above) the penalty corner is now too dangerous to be continued in its present format (a statement I here base on the drag flick shot in the Irwin incident rather than the death of Lizzie Watkins, which D’Cruz mistakenly thought occurred during a penalty corner), but there is also a need for a definition of a dangerously played ball based on objective criteria, such as: 1) at a player and 2) within fifteen metres, 3) at a velocity that could cause injury, and 4) at above sternum height. The emergence of the lifted reverse edge hit, so that it is now the preferred method of shooting at the goal in open play, makes such controls essential because the edge hit is generally not as well controlled, especially regarding height, as hit made with the flat of the face of the stick. Players should be given the facility to judge for themselves when they can evade the ball without ‘giving away’ a goal. At present players are being forced to self-defence when a high ball is played directly at them, because evasion of the ball is generally not seen as ‘legitimate’ by umpires unless the shooter is within five meters of the defender when the ball is propelled (and often not even then – see the first presented video above). When a ball may be propelled at 75mph / 150kph or more, five metres is a ridiculously short distance on which to base ‘dangerous’ – evasion is often not possible from more than twice that distance. To talk of skill level in determining if a ball of that velocity is (or even can be) dangerous is absurd. Endangerment should be based on the propensity of the ball to inflict injury on any person it hits, not on the supposed ability of the person endangered to avoid being hit. The physiology of international level athletes, when it comes to the effects of ball impacts on flesh and bone, is the same as that as any other human being, and the difference in reaction times, between Olympic level athletes and the average healthy individual of the same approximate age, are statically insignificant. I see from the news reports in Perth, Australia…. …that there is movement for the resurrection of a previous campaign to introduced protective helmets for field players. I am sure that this would make the present situation re the dangerously played ball worse rather than better. Past experience has shown – as with the introduction of helmets and HD foam equipment for goalkeepers and the face-mask at a penalty corner for other defenders – that an increase in protective equipment results in a more cavalier attitude to endangering those wearing it. I am also sure sports equipment manufacturers will be adding their support to the proposal, but I feel that the essential first step is to redefine the dangerously played ball so that a goal cannot be scored with a shot that has been lifted high and ‘through’ a defender. If a goal cannot be scored with a shot made ‘at’ an opponent in a dangerous way, but instead the shooter will be penalised, then attackers will stop making such shots. This is the shot that hit Irwin on the head while he was positioned in front of the goal-line. At this point there has already been dangerous play; the ball was raised to above knee height directly at a defender who was within 5m of the shooter, compelling his evasive action. Even if helmets are introduced that alone will not be sufficient action to reduce incidents of injury, it may indeed have the opposite effect. Changes to the Rules concerning the dangerously played ball will be needed even more if field-helmets are introduced. A DOCTOR is on a collision course with hockey officials over the sport’s lack of protective headgear after a young player died in Perth on Sunday. 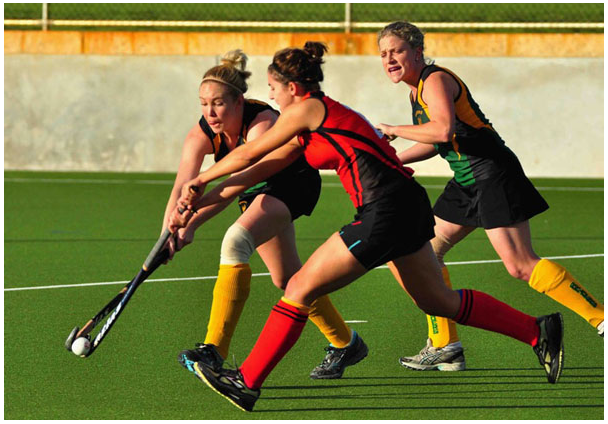 Lizzie Watkins, 24, died after being hit in the head during a match at Curtin University when the ball deflected off her stick. Melbourne doctor Denise Fraser said she would reactivate a campaign to make players wear protective headgear so such a tragedy would not be repeated. “I am a hockey parent and I see a lot of kids hit with the hockey ball,” she said. “A hockey ball … is not like a football or a soccer ball. It is more like a cricket ball, and when you are facing a cricket ball, you wear protective headgear. 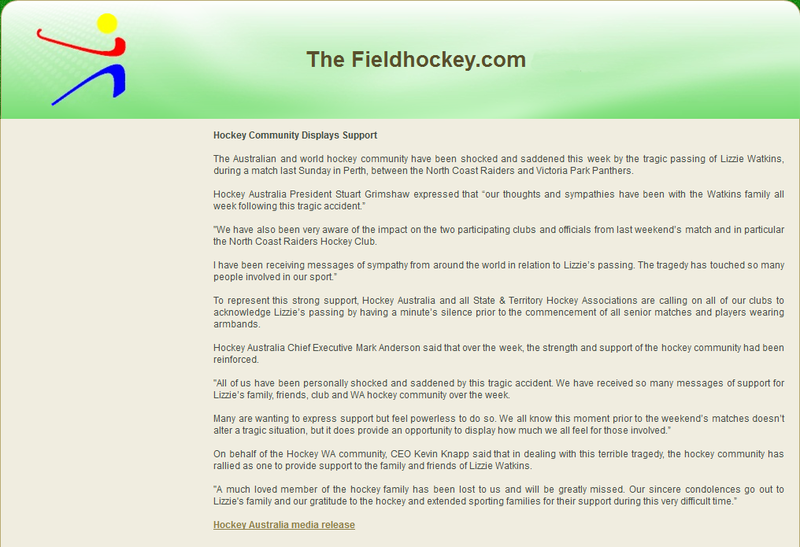 Hockey Australia chief Mark Anderson defended his sport’s safety record, saying the death was the first of its kind. “We certainly believe hockey is a safe sport,” Anderson said. This reply to the Doctor’s comment made in the above letter to the newspaper is typical of the other extreme – and based entirely on assertions that are false. As she said “hockey PARENT” never played the game to see wearing a helmet would get in the way more than anything and cricket players like goal keepers have the ball directly have the ball pelted at them at speed at head height. On the field the ball is meant to be kept below the knee unless flicked over head. People who don’t play the sport should keep stupid comments like that to themselves. If she’s that worried she can make her own kid wear one see how that goes for them…….. PS Wasn’t the ball that killed her was the ticking time bomb in her brain that got knocked enough to rupture. Get all facts before commenting. Frank Watkins later e-mailed to inform me that his daughter had no skull weakness or especially vulnerable area like an embolism in her brain, she was physically a normal healthy individual. Actual Hockey player of Perth has obviously never defended a drag-flick at a penalty corner. The Rules do need to be changed, the dangerously played ball is at present an almost entirely subjective decision by an umpire and a common approach among umpires at present (sic) is that there is no such thing as a dangerous shot on goal. Defenders need to know when they can evade the ball because it WILL be called as dangerous (just as they can with a first hit shot during a penalty corner that is raised too high) and attackers need to know that they will not be allowed to score with a ball that is directed overheight at (‘through’) a defender. If attackers were prevented from scoring with high shots made ‘through’ defenders the problem of the dangerously played ball would rarely arise. The number of near-misses and minor head and face injuries occurring at present, particularly during the penalty corner and when other shots at the goal are made is unacceptable. I am however skeptical of the merits of protective helmets. Past experience has shown that allowing protective wear – like the face-mask at the penalty corner – simply increases the degree of danger players protected with equipment are expected to accept. Penalty corners are another story all together I believe in the higher grades the posties should have to wear a mask and with saying that everyone that plays hockey know the risk and still choose to put themselves in the line of fire. Rules state everything goes in the D IF you are having a direct shot at goal if you choose to stand there knowing full well that’s the rule they are there at their own risk. It’s not a wimpy sport if you can’t deal with it don’t play it and stay at home and knit. The gentleman wrote “PS Wasn’t the ball that killed her was the ticking time bomb in her brain that got knocked enough to rupture. Get all facts before commenting”. I agree that it is helpful to have all the facts concerning the fatal incident, but with nothing else that he has written. I wonder where he got his ‘facts’ about the ‘ticking time bomb’, the nature of the incident and also his opinions about the Rules of Hockey “Rules state everything goes in the D IF you are having a direct shot at goal“. The Rules of course state nothing of the sort, but if theses opinions are generally held, or held even by a minority, then hockey is not a safe sport. And it is not in ‘safe hands’ if administrators and Rule makers do not accept that it is potentially a very dangerous sport. The drag-flick came into being as a way of circumventing the height restriction on the first hit shot during a penalty corner, The FIH should address the circumvention of a Rule which was (and is) intended to curb dangerous play, not ignore it. (Aside from prohibiting the use of a drag-flick when taking a penalty stroke, the drag-flick is not mentioned in the Rules of Hockey, it is not even listed in the Terminology). In other words he said that the shooter in the video he sent to me, shot ‘blindly’ towards where she ‘knew’ the goal to be and she could not have taken account of the position of a defender because she had no time to do so or was blocked (he claims both in separate messages) and the umpire still awarded a goal. Ergo my view of reckless play is wrong. Naturally he has put what I wrote ‘back to front’. in article about the video below (see link) I declare the action of the striker to be reckless precisely because he could see both the goal and the defender and had ample opportunity to make an alternative shot or even to pass the ball to a team-mate for an easy tap-in, but chose instead to raise the ball directly at the defender (who was within 5m of him) with a hit which was raised to above knee height – or rather not to care that that is what he did (or know that it was dangerous play by all the FIH published criteria). Ironically the shooter immediately, before the penalty stoke signal was given, asked for a video referral – a request he withdrew. The other incident we ‘discussed’ (I was abused for my opinion of) was the second one in the following clip. An incident from the Rio Olympics, where an attacker unnecessarily hit the ball hard and high across and past the head of a defender from less than one meter. I had and have no issue with the velocity of the shot but I have with the raising of it, the ball could have been driven low into the backboards, there was nothing the defender could have done to stop it. As it happens the incident he described as correct umpiring (and demonstrating my error) contains one of the worse examples of irresponsible umpiring I have seen, and the attacker, far from shooting ‘blindly’ obviously uses a mental image ‘snapshot’ to define her target, because she clearly looks up as she approaches the ball, she does have the time and space to do so, and executes a perfect hit which is exactly on that target – the gap between the defender and the post. The problem is that the umpire should have stopped play before the shot was taken. .Whether or not the penalty corner was correct is debatable. Had I been umpiring I would not have awarded it but allowed play to continue (there was more likely to have been some danger from swinging sticks than from the low velocity of the ball). In my view the attacker who closes on the raised ball as it is falling, is at least as responsible for the ball hitting her as the defender, who was trying to play it to ground and who had not initially raised the ball towards the attacker (and the attacker may be considered have been guilty of an encroaching offence). It is perhaps odd to view the player who raised the ball as an initial receiver, but the ball was never beyond her playing reach and the attacker was about 5m away from her when the ball was raised. The drag-flick shot towards the defender on the goal-line was dangerous play Others may want to debate or even deny that assertion until ‘the moon turns blue’ but the actions taken by the players are a prima facie example of dangerous play – the ball was propelled directly, at high velocity, at the head of an opponent, who took legitimate evasive action but was nonetheless hit on the head with the ball. It is what followed that hit to the head of the defender that I find astounding (I am no longer even mildly surprised at what is considered “Not a dangerously played ball”). The umpire seeing that the ball had hit the defender on the head and that she had crumpled to ground and was obviously injured, also saw that the ball was rebounding to an approaching attacker and gave a ‘play on – advantage’ signal – putting the fallen defender in harms way. That was dangerously irresponsible, I have never before seen any umpire do that. He had no way of knowing that the approaching attacker would hit the ball along the ground, she could have been as reckless as the shooting player in the first or second videos above. Had a second shot been raised into the defender while she was defenseless on the ground and injured her further, she would have had excellent grounds to take legal action against that umpire for damages for negligence. 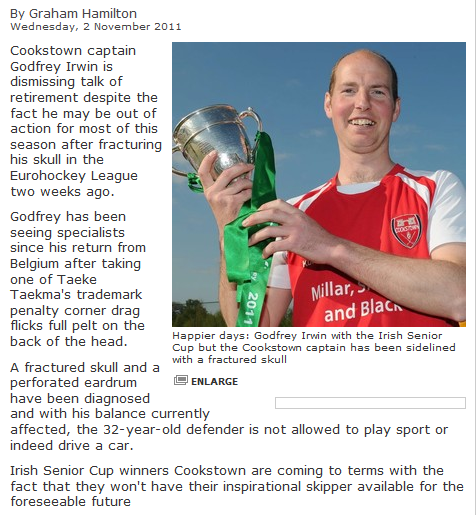 Geoff Erwin of Cookstown who was hit on the head with a similar drag-flick in an EHL match, suffered a fractured skull and a perforated eardrum from that single hit and was off work for a year, damages in cases where an initial injury is compounded by negligence (in addition to the negligence of not penalising the initial shot – which gives encouragement to attackers to make such shots) could be very substantial. The umpire of the incident shown in the last video, after awarding a goal, didn’t even check to see if the defender was cut or concussed and there is no evidence he allowed medical aid staff onto the pitch to examine her or that he asked her to step off for a substitute until others considered she was fit to resume play. What was he thinking? Probably nothing at all. As team coach at a tournament I would voice the strongest possible objection to that umpire officiating in any match my team were due to play. Participants in hockey must be aware of the Rules of Hockey and of other information in this publication. They are expected to perform according to the Rules. my ex ‘friend’ is one of them. The words participants and everyone both include umpires. The umpire at the other end not long afterwards awarded a penalty stroke when a forward fell in the circle. I have looked at that incident several times and can see no justification at all for a penalty stroke. Maybe, and it is a very weak maybe, a penalty corner could be argued for. So, at that point, 1-1 the umpires.